Carbon dioxide (CO2) capture and storage (CCS) is the one advanced technology that conventional power generation cannot do without. CCS technology reduces the carbon footprint of power plants by capturing and storing the CO2 emissions from burning fossil-fuels and biomass. Volume one provides a comprehensive reference on the state of the art research, development and demonstration of carbon capture technology in the power sector and in industry. It critically reviews the range of post- and pre-combustion capture and combustion-based capture processes and technology applicable to fossil-fuel power plants, as well as applications of CCS in other high carbon footprint industries. 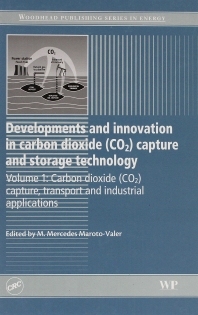 Volume two provides a comprehensive reference on the state of the art research, development and demonstration of carbon storage and utilisation, covering all the storage options and their environmental impacts. It critically reviews geological, terrestrial and ocean sequestration, including enhanced oil and gas recovery, as well as other advanced concepts such as industrial utilisation, mineral carbonation, biofixation and photocatalytic reduction. Professor M. M. Maroto-Valer holds the Robert M. Buchan Chair in Sustainable Energy Engineering and is Head of the Institute of Mechanical, Process and Energy Engineering (IMPEE), School of Engineering & Physical Sciences, Heriot-Watt University, UK. She is noted for her research into energy and environmental technologies, with particular emphasis on carbon management.